Now, let’s hear what Eric has to say on this! (My comments from this point on will attempt to contain themselves in parentheses. You can find the slides for his talk – all 62MB of them – from this link on his website. ) It’s important to remember that one of the reasons that Eric’s work is so interesting is that he is looking for evidence-based approaches to education. Eric discussed the use of flashcards. A week after Flashcard study, students retain 35%. After two weeks, it’s almost gone. He tried to communicate this to someone who was launching a cloud-based flashcard app. Her response was “we only guarantee they’ll pass the test”. Of course most students study to pass the test, not to learn, and they are not the same thing. For years, Eric has been bashing the lecture (yes, he noted the irony) but now he wants to focus on changing assessment and getting it away from rote learning and regurgitation. The assessment practices we use now are not 21st century focused, they are used for ranking and classifying but, even then, doing it badly. So why are we assessing? What are the problems that are rampant in our assessment procedure? What are the improvements we can make? Improve the teaching and learning. Ah, but look at the verbs – they are multi-purpose and in conflict. How can one thing do so much? So what are the problems? Many tests are fundamentally inauthentic – regurgitation in useless and inappropriate ways. Many problem-solving approaches are inauthentic as well (a big problem for computing, we keep writing “Hello, World”). What does a real problem look like? It’s an interruption in our pathway to our desired outcome – it’s not the outcome that’s important, it’s the pathway and the solution to reach it that are important. Typical student problem? Open the book to chapter X to apply known procedure Y to determine an unknown answer. Shout out to Bloom’s! Here’s Eric’s slide to remind you. Rights reside with Eric Mazur. Eric doesn’t think that many of us, including Harvard, even reach the Applying stage. He referred to a colleague in physics who used baseball problems throughout the course in assignments, until he reached the final exam where he ran out of baseball problems and used football problems. “Professor! We’ve never done football problems!” Eric noted that, while the audience were laughing, we should really be crying. If we can’t apply what we’ve learned then we haven’t actually learned i.
Eric sneakily put more audience participation into the talk with an open ended question that appeared to not have enough information to come up with a solution, as it required assumptions and modelling. From a Bloom’s perspective, this is right up the top. Students loathe assumptions? Why? Mostly because we’ll give them bad marks if they get it wrong. But isn’t the ability to make assumptions a really important skill? Isn’t this fundamental to success? Eric demonstrated how to tame the problem by adding in more constraints but this came at the cost of the creating stage of Bloom’s and then the evaluating and analysing. (Check out his slides, pages 31 to 40, for details of this.) If you add in the memorisation of the equation, we have taken all of the guts out of the problem, dropping down to the lowest level of Bloom’s. But, of course, computers can do most of the hard work for that is mechanistic. Problems at the bottom layer of Bloom’s are going to be solved by machines – this is not something we should train 21st Century students for. But… real problem solving is erratic. Riddled with fuzziness. Failure prone. Not guaranteed to succeed. Most definitely not guaranteed to be optimal. The road to success is littered with failures. But, if you make mistakes, you lose marks. But if you’re not making mistakes, you’re very unlikely to be creative and innovative and this is the problem with our assessment practices. Eric showed us a stress of a traditional exam room: stressful, isolated, deprived of calculators and devices. Eric’s joke was that we are going to have to take exams naked to ensure we’re not wearing smart devices. We are in a time and place where we can look up whatever we want, whenever we want. But it’s how you use that information that makes a difference. Why are we testing and assessing students under such a set of conditions? Why do we imagine that the result we get here is going to be any indicator at all of the likely future success of the student with that knowledge? Cramming for exams? Great, we store the information in short-term memory. A few days later, it’s all gone. Assessment produces a conflict, which Eric noticed when he started teaching a team and project based course. He was coaching for most of the course, switching to a judging role for the monthly fair. He found it difficult to judge them because he had a coach/judge conflict. Why do we combine it in education when it would be unfair or unpleasant in every other area of human endeavour? We hide between the veil of objectivity and fairness. It’s not a matter of feelings. But… we go back to Bloom’s. 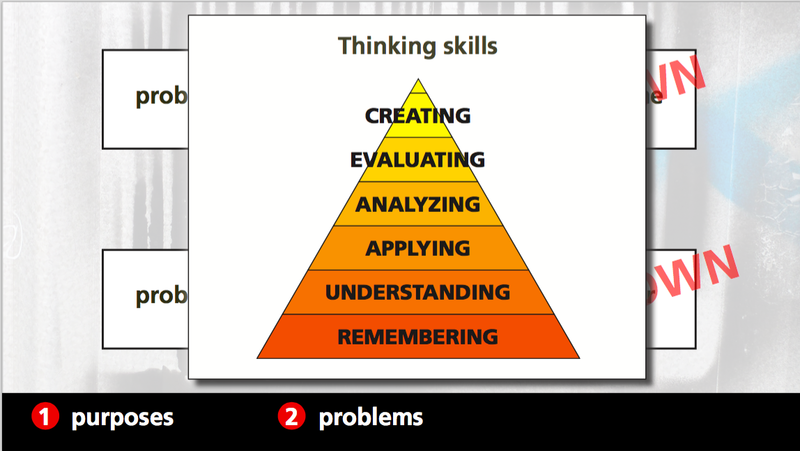 The only thinking skill that can be evaluated truly objectively is remembering, at the bottom again. But let’s talk about grade inflation and cheating. Why do people cheat at education when they don’t generally cheat at learning? But educational systems often conspire to rob us of our ownership and love of learning. Our systems set up situations where students cheat in order to succeed. Mimic real life in assessment practices! Open-book exams. Information sticks when you need it and use it a lot. So use it. Produce problems that need it. Eric’s thought is you can bring anything you want except for another living person. But what about assessment on laptops? Oh no, Google access! But is that actually a problem? Any question to which the answer can be Googled is not an authentic question to determine learning! Eric showed a video of excited students doing a statistic tests as a team-based learning activity. After an initial pass at the test, the individual response is collected (for up to 50% of the grade), and then students work as a group to confirm the questions against an IF AT scratchy card for the rest of the marks. Discussion, conversation, and the students do their own grading for you. They’ve also had the “A-ha!” moment. Assessment becomes a learning opportunity. Eric’s not a fan of multiple choice so his Learning Catalytics software allows similar comparison of group answers without having to use multiple choice. Again, the team based activities are social, interactive and must less stressful. Focus on feedback, not ranking. Objective ranking is a myth. The amount of, and success with, advanced education is no indicator of overall success in many regards. So why do we rank? Eric showed some graphs of his students (in earlier courses) plotting final grades in physics against the conceptual understanding of force. Some people still got top grades without understanding force as it was redefined by Newton. (For those who don’t know, Aristotle was wrong on this one.) Worse still is the student who mastered the concept of force and got a C, when a student who didn’t master force got an A. Objectivity? Injustice? Eric referred to Wiggins and McTighe, “Understanding by Design.” Traditional approach is course content drives assessment design. Wiggins advocates identifying what the outcomes are, formulate these as action verbs, ‘doing’ x rather than ‘understanding’ x. You use this to identify what you think the acceptable evidence is for these outcomes and then you develop the instructional approach. This is totally outcomes based. In his project-based course, Eric brought in external evaluators, leaving his coach role unsullied. This also validates Eric’s approach in the eyes of his colleagues. Peer- and self-evaluation are also crucial here. Reflective time to work out how you are going is easier if you can see other people’s work (even anonymously). Calibrated peer review, cpr.molsci.ucla.edu, is another approach but Eric ran out of time on this one. If we don’t rethink assessment, the result of our assessment procedures will never actually provide vital information to the learner or us as to who might or might not be successful. I really enjoyed this talk. I agree with just about all of this. It’s always good when an ‘internationally respected educator’ says it as then I can quote him and get traction in change-driving arguments back home. Thanks for a great talk! This was very interesting. I work with some younger faculty in the dept who heavily use Learning Catalytics and introduced me to the idea, but I did not know its roots were right here. I will look more closely at what has been happening in front of my nose. I often find I have to travel a lot to find out what’s going on back home!